Yersina enterocolitica is a causative agent of gastrointestinal disorders in humans with a variety of clini­cal manifestations, including reactive arthritis and erythema nodosum (Bottone, 1997). Pathogenic strains of Y. enterocolitica harbour a suit of virulence factors encoded on virulence plasmid pYV and the chromo­some. Strains of bioserotype 1B/O8 are considered lethal to mouse and highly pathogenic to humans(Aulisio et al., 1983). Y. enterocolitica 1B/O8 was origi­nally reported in northern America in the 70s and 80s of the past century. In the early 90s bioserotype 1B/O8 disappeared in America and emerged in Japan(Ichinohe et al., 1991). The first case of human Y. entero­colitica 1B/O8 infection in Europe was reported in Ger­many (Schubert et al., 2003). However, this bacterium is nowadays most numerously isolated in Poland, where 224 human clinical isolates were collected from 2004 to 2013. Y. enterocolitica 1B/O8 isolates collected were tightly clonal (Gierczyński et al., 2009; Zacharczuk, 2012). The bacterium is an important causative agent of yersiniosis in Poland as shown by serological studies (Rastawicki et al., 2013). High pathogenicity of Y. enterocolitica 1B/O8 is attributed to virulence factors encoded in the chromo­some. Chromosomal type III protein secretion system (T3SS) named Yersinia secretion apparatus (Ysa) is con­sidered a potential virulence factor of the bacterium. Ysa was found to have specific induction conditions – nutrient rich medium supplemented with a high salt concentration (190–400 mM NaCl or KCl) at a moder­ate temperature (26–28°C) (Haller et al., 2000, Venecia and Young, 2005). Therefore, Ysa activity was initially considered as limited to the gastrointestinal tissues. The T3SS was shown to translocate some specific proteins named Yersinia secreted proteins (Ysps) (Haller et al., 2000, Venecia and Young 2005). Moreover, Ysa was found to secrete some of pYV‑encoded Yersinia outer proteins (Yops) (Venecia and Young 2005). In recent studies, Ysa was proposed to act also at the systemic phase of the disease (Bent et al., 2013). All the afore­mentioned findings were derived from investigations conducted on laboratory reference strainsof Y. entero­colitica 1B/O8 and their mutants. However, little is known about Ysa activity in clinical isolates. Therefore we decided to investigate the Ysa activity in clinical isolates of Y. enterocolitica 1B/O8 collected in Poland. Clinical strain DM0110 of Y. enterocolitica 1B/O8 originated in Poland in 2005 and was selected for DNA-sequencing of the complete Ysa pathogenicity-island (Ysa-PI). DNA-sequencing was conducted by Sanger method using a BigDye Terminator v3.1 (Applied Bio­system). A library of 1.5–2.5 kbp fragments of Ysa-PI of DM0110 was cloned in plasmid pJet1.2/blunt Clon­ing Vector (Thermo Scientific, Lithuania) prior to DNA sequencing. Sequencing results were read on automated capillary sequencers in a biotechnological company (Genomed, Poland). Reviewed complete 30379 bp – long YSA-PI cluster was deposited in GenBank (www.ncbi.nlm.nih.gov) database under no. KC784374.1. Further examinations were performed on a number of 78 clinical isolates and 11 reference strains (Table I). PFGE typing (data not shown) showed that all the iso­lates were tightly-clonal and belonged to the previously described XbaI genotype II (Gierczyński et al., 2009). Ysa and Ysps proteins were visualised by SDS-PAGE assay. The assay was performed in accordance with the procedure described by Matsumoto and Young (2006). Eight Y. enterocolitica 1B/O8 clinical isolates originat­ing in Poland were tested by SDS-PAGE together with DM0110 and the 11 reference strains listed in Table I. Bands specific for Ysps and Ysa proteins were detected for the reference strains only. In contrast to the refer­ence strain WA-314 no Ysps could be detected for clini­cal isolate DM0110 in duplicate experiments (Fig. 1A). Ysps were also lacking in seven randomly selected clini­cal isolates (Fig. 1B). The Ysa-PI sequence of DM0110 was aligned to the homologous loci deposited in commonly acces­sible databases using CLC Sequence Viewer 7 (CLC Inc, Denmark). Comparison of nucleotide and deduced amino-acid sequences of Ysa-PI of Y. enteroco-litica 1B/O8 reference strains: 8081 (NC_008800.1), A127/90 (AF369954.1 and AY100449.2) and WA314 (AKKR01000083) was conducted to trace amino-acid substitutions and other alterations. DM0110 revealed 99% homology to Ysa-PI of ref­erence strains 8081, A127/90 and WA314. No struc­tural aberrations were observed. The only significant mutation specific for tested DM0110 was found in ysrRgene that is part of the YsrRST phosphorelay system (Venecia and Young 2005, Walker et al., 2010). Single nucleotide substitution (C to A) at position 269 of ysrR resulted in a premature stop‑codon that terminates translation of YsrR at position 90. No such mutation was found in the reference Y. enterocolitica 1B/O8 strains examined in this study. Yersinia enterocolitica 1B/O8 reference strains and clinical isolates tested in this study. To verify whether the stop-codon prematurely ter­minates the expression of ysrRin DM0110, the complete ysrR gene (711 bp length) from DM0110 was cloned to expressing vector and examined in Escherichia coli. Expression system pET-30 Ek/LIC Vector Kit (Novagen, USA) was used according to the manufacturer’s instruc­tion. The unaltered ysrR gene from strain WA-314 was used as a reference. Recombinant proteins of both DM0110 and WA-314 were purified on column with Ni2+ ‑ISA His‑Binding Resin (Novagen, USA). Molecular weight of the expressed recombinant proteins was determined by SDS-PAGE according to Laemmli (1970).The recombinant YsrR protein of DM0110 was about 10 kDa, while the YsrR recombinant of the unal­tered ysrR gene from WA-314 was 27 kDa. These results confirmed that the premature stop-codon in ysrR is active in vitro. Further analysis in silico performed with Domain Enhanced Lookup Time Accelerated BLAST (DELTA-BLAST) algorithm showed that YsrR protein REC domain is only half-expressed in DM0110 while the LuxR-C-like domain is lacking. To determine whether other clinical isolates of Y. enterocolitica 1B/O8 in Poland carry unaltered or prematurely-terminated ysrR, PCR-RFLP assay target­ing the unaltered (wild-type) ysrR gene was developed. Primers (ysrR-F 5’ATGACACAAACGAAAACGCT­CAAT and ysrR-R 5’TTATAGAGAAATTTCATGAG­CAT) were used to amplify the 711 bp PCR‑product of the ysrR gene. PCR was conducted as described pre­viously (Wołkowicz et al., 2014). The ysrR PCR-prod­uct was further digested by BtsI endonuclease (NewEngland BioLabs) as recommended by the manufac­turer. The PCR‑product of the unaltered, wild‑type ysrR gene yielded two fragments of expected size 268 and 445 bp. In the case of mutation in position 269 of ysrR, the PCR‑product remained undigested. In each PCR-RFLP experiment the reference strain WA-314 was used as a control for the wild-type ysrR. DM0110 and all the tested clinical isolates listed in Table I were shown by the PCR-RFLP assay to bear ysrR gene altered in posi­tion specific for the premature stop-codon. No altera­tions were detected in ten reference strains of Y. entero­colitica 1B/O8 (Table I) previously found to secrete Ysps (Rokosz-Chudziak et al., 2013). In the past two decades Y. enterocolitica 1B/O8 emerged in Japan, Germany and Poland. Since 2004 this bacterium has been isolated in Poland from humans with clinically confirmed yersiniosis. Noteworthy, all clinical isolates of Y. enterocolitica 1B/O8 in Poland were found to be tightly clonal (Gierczyński et al., 2009, Zacharczuk, 2013). Y. enterocolitica 1B/O8 was isolated from a variety of clinical samples including stool and blood. We, therefore, assumed our collections of clini­cal isolates constitute an excellent material to study Ysa activity in human yersiniosis. The results obtained in this study are, however, surprising when compared with other reports on Ysa T3SS published to date (Venecia and Young 2005, Mat­sumoto and Young 2006, Mildiner-Earley et al., 2007, Bent et al., 2013). First of all we showed that clinical isolates of Y. enterocolitica 1B/O8 collected in Poland from 2004 to 2009 were unable to secrete Ysps. Moreo­ver, clinical isolate DM0110 was unable to produce Ysps under a variety of inducible conditions described else­where (Mildiner-Earley et al., 2007, Witkowski et al., 2008) (data not shown). These findings together have prompted us to search Ysa-PI of DM0110 for possible reasons for Ysa inactivation. One particularly interest­ing mutation in the ysrR gene of YsrRST phosphorelay system was detected. This mutation triggers the prema­ture stop-codon that early terminates the translation of regulatory gene ysrR. The YsrRST phosphorelay system is considered themajor regulatory system for YSA-PI (Venecia and Young,2005, Walker et al., 2010). Consequently, the prema­ture stop-codon in ysrR may play a key role in Ysa T3SS silencing in Y. enterocolitica 1B/O8 circulating in Poland. Noteworthy, disruption of the ysrR gene has been already reported to inactivate Ysps secretion by Ysa T3SS. Similarly to strain DM0110, a ysrR mutant of Y. enterocolitica 1B/O8 strain JB580v, constructed by Venecia and Young (2005), was also found unable to secrete Ysps. Our results showed that expression of ysrR in the clinical strain of Y. enterocolitica 1B/O8 is terminated at one third of the functional protein. Important REC and LuxR-C-like domains of the functional YsrR are, therefore, lacking or partially expressed in Y. enteroco­litica 1B/O8 circulating in Poland. Interestingly, PCR-RFLP test showed that all investigated clinical isolates from Poland bear the altered ysrR gene. This finding corresponds with the strong clonality of clinical isolates of Y. enterocolitica 1B/O8 in Poland revealed by PFGE. Therefore, we conclude that the premature stop-codon in the ysrR gene may serve as a hallmark of the epidemic sensu stricto strain of Y. enterocolitica 1B/O8 in Poland. To the best of our knowledge, dysfunctional YSA-PI has not been yet reported in Y. enterocolitica 1B/O8 from patients with clinically confirmed yersiniosis. Our findings together may, however, suggest that Ysa T3SS is not indispensable for Y. enterocolitica 1B/O8 to cause infection in human. Preliminary results of this study were, in part, pre­sented during the 11th International Symposium on Yersinia, Suzhou, China, 24–28 June 2013 (Rastawicki W.,Szych J., Rokosz N., Zacharczuk K., Wołkowicz T. and Gierczyński R. The emergence of high-pathogenicity Yersinia enterocolitica bioserotype 1B/O8 infections in Poland. Final Program Yersinia 11th, pp. 74). This study was supported by grant NN 401 076039 from National Science Centre of Poland. We are grateful to dr Elisabeth Carniel from Pasteur Institute, Paris, France and dr Alexander Rakin from The Max von Pettenkofer-Institute of Hygiene and Medical Microbiology, Munich, Germany for support in the reference strains of Y. enterocolitica 1B/O8. Aulisio C.C., W.E. Hill, J.T. Stanfield and R.L. Sellers Jr. 1983. Evaluation of virulence factor testing and characteristics of patho­genicity in Yersinia enterocolitica. Infect. Immun. 40:330–335. Bent Z.W., S.S. Branda and G.M. Young. 2013. The Yersinia entero­colitica Ysa type III secretion system is expressed during infections both in vitro and in vivo. Microbiology open 2:962–975. Bottone E.J. 1997. Yersinia enterocolitica: the charisma continues. Clin. Microbiol. Rev. 10:257–276. Chatterjee R., P.K. Halder and S. Datt. 2013. Identification and molecular characterisation of YsaL (YE3555): a novel negative regu­lator of YsaN ATPase in type three secretion system of enteropatho­genic bacteria Yersinia enterocolitica. PLoS One 8:e75028. Garzetti D., H. Bouabe, J. Heesemann and A. Rakin. 2012. Trac­ing genomic variations in two highly virulent Yersinia enterocolitica strains with unequal ability to compete for host colonization. BMC Genomics 13:467. Gierczyński R., J. Szych, W. Rastawicki, S. Wardak and M. Jagielski.2009. Molecular characterization of human clinical isolates of Yersinia enterocolitica bioserotype 1B/O8 in Poland: emergence and dissemination of three highly related clones. J. Clin. Micobiol. 47:1225–1228. Haller J.C., S. Carlson, K.J. Pederson and D.E. Pierson. 2000. A chromosomally encoded type III secretion pathway in Yersinia en-terocolitica is important in virulence. Mol. Microbiol. 36:1436–1446. Ichinohe H., M. Yoshioka, H. Fukushima, S. Kaneko and T. Maruyama. 1991. First isolation of Yersinia enterocolitica sero­type O:8 in Japan. J. Clin. Microbiol. 29:846–847. Laemmli U.K. 1970. Cleavage of structural proteins during the assembly of the head ofbacteriophage T4. Nature 227:680–685. Matsumoto H. and G.M. Young. 2006. Proteomic and functional analysis of the suite of Ysp proteins exported by the Ysa type III secretion system of Yersinia enterocolitica biovar 1B. Mol. Microbiol. 59:689–706. Mildiner-Earley S., K.A. Walker and V.L. Miller. 2007. Environ­mental stimuli expression of the Ysa type three secretion locus. In: Perry R.D. and J.D. Fetherston (eds. ), pp. 211–213. The genus Yer­sinia: from genomics to function. Springer Science-Business Media, LLC., USA. Rastawicki W., J. Szych, N. Rokosz, K. Zacharczuk and R. Gier-czyński. 2013. Seasonality of Yersinia enterocolitica bioserotype 1B/O:8 infections in Poland. Epidemiol. Infect. 141:2039–2042. Rokosz-Chudziak N., W. Rastawicki, K. Zacharczuk and R. Gierczyński. 2013. 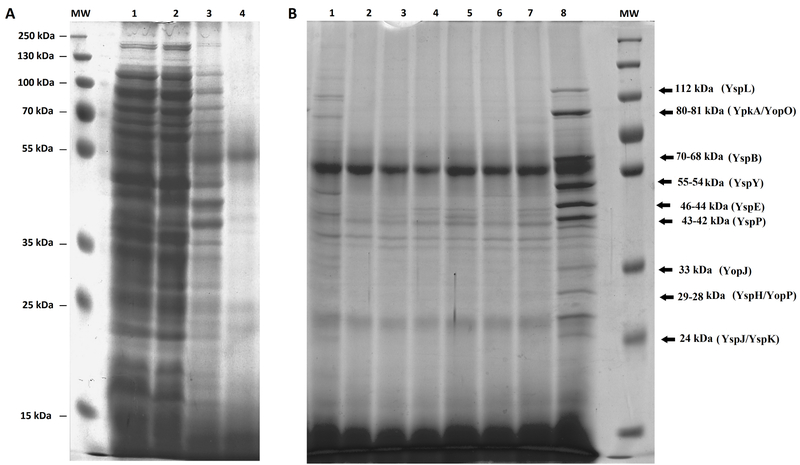 Electrophoretic and immunological analysis of native proteins secreted in vitro under conditions inducing Ysa (Yersinia secretion apparatus) by clinical isolates of Yersinia enterocolitica 1B/O8 in Poland (in Polish). Med. Dośw. Mikrobiol. 65:245–254. Schubert S., J. Bockemühl, U. Brendler and J. Heesemann. 2003. First isolation of virulent Yersinia enterocolitica O8, biotype 1B in Germany. Eur. J. Clin. Microbiol. Infect. Dis. 22:66–68. Venecia K. and G.M. Young. 2005. Environmental regulation and virulence attributes of the Ysa type III secretion system of Yersinia enterocolitica biovar 1B. Infect. Immun. 73:5961–5977. Walker K.A., M.W. Obrist, S. Mildiner-Earley and V.L. Miller. 2010. Identification of YsrT and evidence that YsrRST constitutea unique phosphorelay system in Yersinia enterocolitica. J. Bacteriol. 192:5887–5897. Witkowski S.E., K.A. Walker and V.L. Miller. 2008. YspM, a newly identified Ysa tyle III secreted protein of Yersinia enterocolitica. J. Bacteriol. 190:7315–7325. Wołkowicz T., N. Wolaniuk, K. Zacharczuk, R. Gierczyński, N. Rokosz and W. Rastawicki. 2014. Development of molecular PCR-RFLP test for identification of the epidemic strain of Y. enterocolitica bioserotype 1B/O8 circulating in Poland since 2004 (inPolish). Med. Dośw. Mikrobiol. 66:89–98. Zacharczuk K. 2012. Ph.D. Thesis, Molecular characterisation of human clinical isolates of Yersinia enterocolitica 1B/O8 collected in Poland in 2009. National Institute of Public Health-National Insti­tute of Hygiene. Warsaw, Poland.